The bell rang three times. The ashramites knew Amma would be coming any moment. Everyone rushed to Amma’s courtyard. The gates were open wide for Amma’s car. But then when the crowd heard the sound of excited voices by the old temple, they realized that Amma was coming via a side passage—on foot. Amma had exited Her car by Ram the ashram elephant’s house. By the time Amma made it to Her steps, She had several red and pink garlands around Her neck. She stood there for some time, allowing all the ashramites to take in their first site of Her in two months. 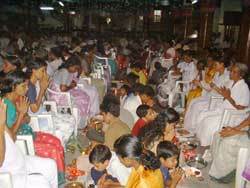 One grandmother who lives at the ashram, performed Amma’s padapuja. Then one devotee showed Amma a baby squirrel, which she had been taking carry of during Amma’s absence. The squirrel quickly jumped to Amma’s shoulder. After making sure She could see all of Her children (even squinting to see the ones in the far back), Amma climbed Her stairs to Her room. No one wanted Her to go—especially the baby squirrel, which clung to Amma’s sari, trying as he could to not let go. 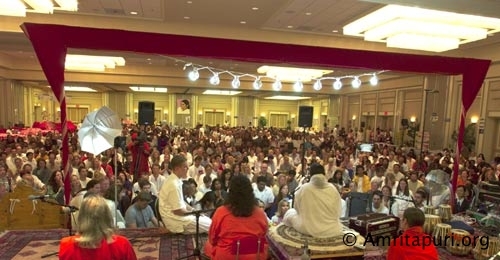 From San Ramon, Amma reached Seattle for next darshan. 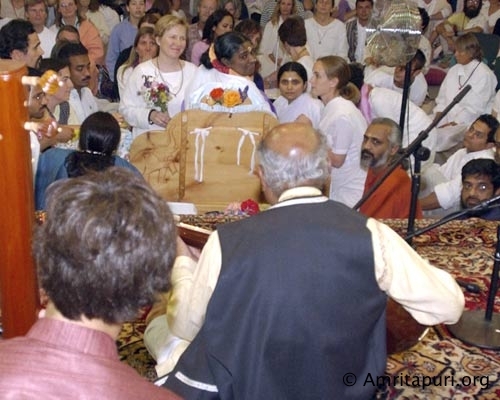 Amma visited Los Angeles county as part of her USA 2003 Tour. 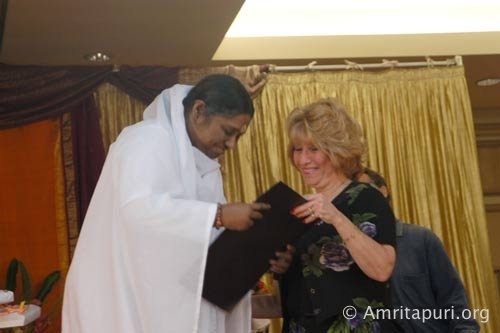 A commendation was awarded to Amma by Susan Nissman on behalf of 10 million people of Los Angeles County phrasing “constituency is colorless and She makes no judgement in terms of healing, and Her good works”. 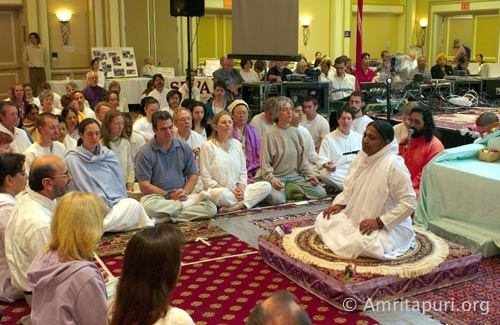 Morning programs was started with Meditation and followed by Amma’s Satsang where a large crowd attentively listened to it. 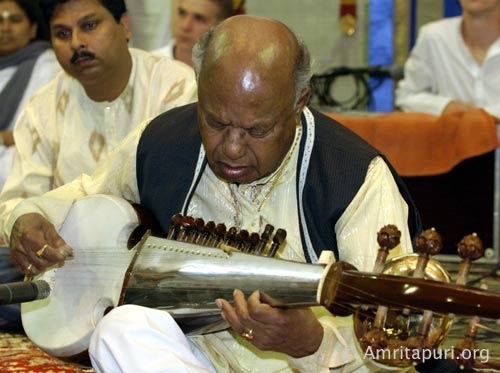 Famous master of the sarod, Ali Akbhar Khan, played for Amma during darshan. Just as a person needs air to breathe, the soul needs to be nurtured with love and care. The need of love is felt the most when we fall sick, physically or mentally. More than half the cure is done by the power of love. Hence, doctors and nurses also have a special responsibility to treat their patients with love, care and affection. Being in the medical profession gives doctors and nurses a golden opportunity to express the divinity latent in every being. Brackish water in a vessel can be made drinkable if we keep adding pure water to it. Similarly, by consciously developing and expressing the virtues within us, we can transform our character and change our destiny. Fate is nothing but the sum total of our past actions. Hence, by consciously controlling our thoughts, words, and deeds at present, we can shape our own future. From a spiritual viewpoint, the disease of materialism afflicts all of us, and this is the root cause of all our suffering. The purpose of human life is to transcend the animalistic tendencies inherited by birth and to develop the potential divine qualities within us. When a doctor serves the patients with right understanding and love, the doctor is also helping him or herself to attain a healthy and happy life. According to the Vedic science of Ayurveda, medicines were once collected, processed, and administered with appropriate mantras and at the proper time and season. They considered all diseases a deviation from the natural harmony of life. They taught that the total cure of any illness always entails restoring the harmony between the body and mind of the patient, as well as the harmony between the patient, his or her family and society. Such principles are equally applicable to the modern medical system also. After a full weekend of Amma’s programs in the Chicago area, the working Monday morning still found devotees making their way into Amma’s soothing presence, yearning for more time in the peaceful vicinity of this Spiritual Master in the form of a loving Mother. On this day, the crowded hall was graced by the visit of two esteemed dignitaries – the mayor of the host city of Naperville, as well as the mayor of the neighboring city of Lisle. A little later, Mayor Joseph Broda from the neighboring city of Lisle, which has had the honor of hosting Amma in previous years, came forward to extend his welcome. “I just wanted to offer my greetings to Amma,” he said, “Welcome, Amma, to the Naperville-Lisle area. I would like to present Amma with the keys to the Village of Lisle. 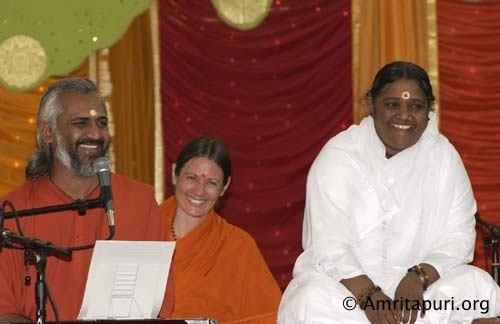 I wish Amma the best in the future towards helping the poor.” Mayor Broda then presented Amma with the Key to the Village of Lisle, and Amma held him warmly in a loving darshan. 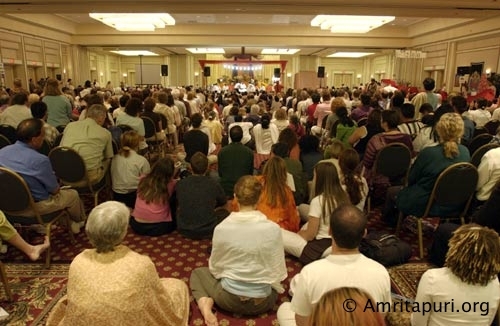 The honor and welcome that Amma receives from the cities that She blesses with Her presence is recognition of Amma’s globe-spanning labor of love and selfless service. This official appreciation coming from the higher circles of government is an acknowledgment of Amma’s love and compassion reaching even the most destitute in society. 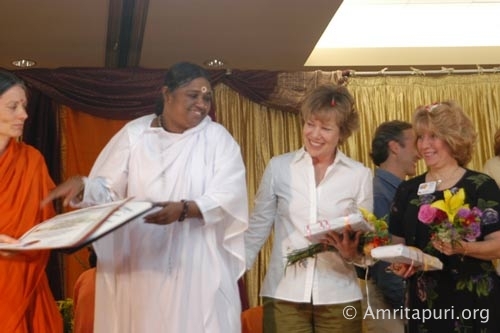 With the example of Her life, Amma inspires every person that She comes into contact with to do more for the world around them, thus extending Her arms to reach and hold more of Her children in Her loving embrace. No matter what one may say about Amma not being confined to the physical body, Her physical presence does make a difference. Anyone who has met Her will vouchsafe for that. But absence has the virtue of making the heart grow fonder. 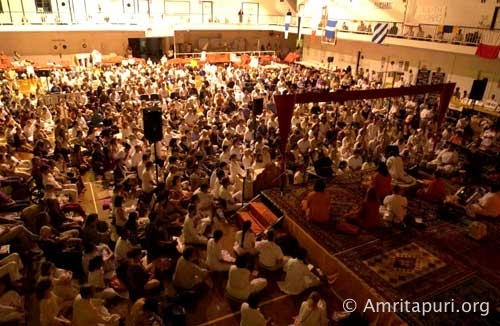 Those who participated in the Guru Purnima celebrations at Amritapuri — in the conspicuous absence of the Guru — must have felt deep currents of longing for Amma, who is, at present, with Her blessed American children. With Her photo on the parasol-shaded throne and Her form in their forlorn hearts, about 2,000 people gathered in the prayer hall for the day-long celebrations, which started at 5:00 a.m. with the archana. This was followed by the paduka puja (ceremonial washing of Amma’s sandals). 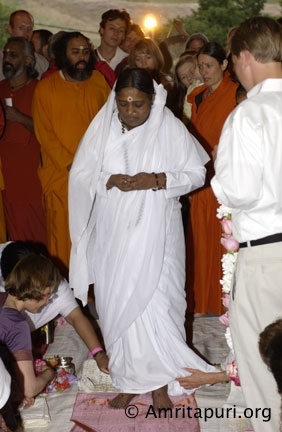 As Swami Turiyamritananda Puri, one of Amma’s senior monastic disciples, performed this ceremony, everyone watched intently, each feeling as if he or she was personally worshipping Amma’s sacred feet. Swami Turiyamritanandaji later distributed prasad. After breakfast, everyone re-grouped for samskriti puja. Guided by Br. Shivamrita Chaitanya, children did pada puja to their parents, a token expression of their debt of gratitude. The highlight of the day was Amma’s phone call, at about 1: 40 p.m. The ashram residents rallied around the speaker to quench their thirst for Amma’s voice. After inquiring about Her children’s health, Amma said a few words about Guru Purnima. 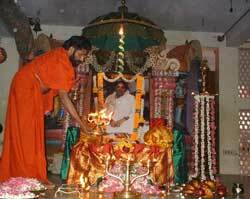 “Guru Purnima is not a day set aside for the Guru. The Guru does not have any special day. It is a day for the disciple. Every disciple must inquire every day if disciplehood has awakened within. For one who has awakened this disciplehood, everyday becomes Guru Purnima. In fact, Guru Purnima is meant to be celebrated every day, not just once a year. “The Guru is striving to put out the flame of our ego and kindle the inextinguishable light of knowledge within us. The disciples, on their part, must surrender to the Guru. Amma’s love-filled utterances inspired both joy and sorrow in Her children who are yearning for Her return. An hour later, the sonorous chanting of the Bhagavad Gita filled the air; its luminous lines entered the hearts. This soulful ambience was sustained by the evening bhajans. After the long day, some lingered outdoors, instead of retiring to their rooms. They were gazing at the full moon, its radiance and splendour a visible reminder of Amma, who is watching over us all, every moment, every day.